package:jumpsuit mitts feet and mask.Available in the following ColorsArt.45040 – Black Art.45045 – Pink Art.45051 – White Art.45053 – Yellow Art.45052 – Red Art.45049 – Blue Art.45048 – Purple Art.45050 – Green Art.45054 – Brown Art.45056 – Grey Art.45055 – Beige Available in the following sizeï¼chestï¼42-48″; waist:34-38″ ;inseam:30″.Note: This Mascot costume runs a little bit larger than regular standard size costume. Return Policy: The buyer need to pay for the shipping fee and 15% restore fee if non product problems.And please return product within 14 days after receive it. 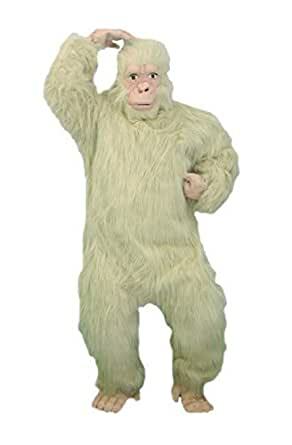 Gorilla Adult Costume This costume includes jumpsuit mitts feet and mask. A great costume for surprising guests as well as Halloween costume parties!Available in the following ColorsArt.45040 – Black Art.45045 – Pink Art.45051 – White Art.45053 – Yellow Art.45052 – Red Art.45049 – Blue Art.45048 – Purple Art.45050 – Green Art.45054 – Brown Art.45056 – Grey Art.45055 – Beige Available in the following sizeNote: This Mascot costume runs a little bit larger than regular standard size costume.